Step 2. The artist draws the outer contours of the face over the egg shape, capturing the curves of the checks, jaw, and chin. Swift, curving iines capture the sweep of the hair around the head and over the forehead. 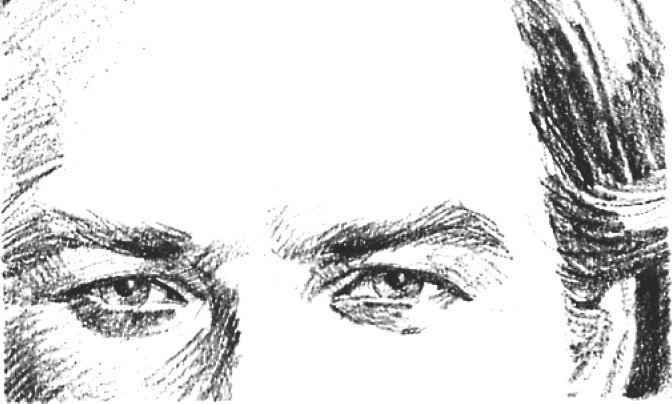 He draws the first few lines of the features over the guidelines of Step 1: the curves of the eyebrows and the upper lids: the side and underside of the nose; and the upper and lower lips. The one visible ear is aligned with the eye and nose. As you can see, the roughness of the paper breaks up the pencil stroke and produces a ragged line. Step 3. The artist completes his preliminary line drawing of the outer contours of the head and the shapes of the features. He strengthens the lines of the jaw and the chin. He draws the ear more precisely and adds the inner contours of the eyes, with a hint of darkness on the irises. 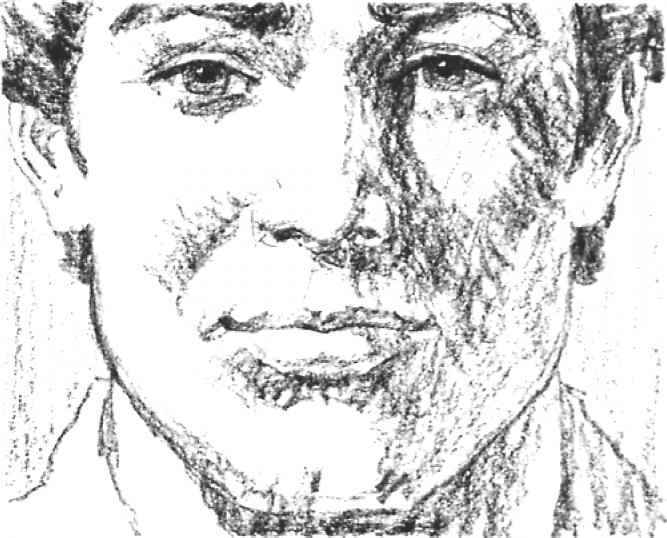 He traces the bridge of the nose and constructs the tip of the nose and the nostril wrings, He indicates the groove from the base of the nose 10 the upper lip, As he defines the lips, lie darkens the corners of the mouth and indicates the concavity beneath the lower lip with a dark scrib-blc. The outline of the hair is strengthened with quick, casual lines. Step 4. Now the artist turns the thick lead on its side and moves it swiftly back and forth over the rough surface of the paper to indicate the big tonal areas. The paper is so rough that you can hardly see the individual strokes—the texture of the paper dominates the tones. The lines of Steps 1, 2, and 3 rapidly disappear under the ragged masses of tone. For the paler lones. the artist moves the drawing tool lightly over the paper, pressing harder and piling up additional strokes for the darker areas—such as the eye sockets, the checks, the shadow cast hy the nose, and the hair. Most of the original lines have disappeared under the tones. The artist erases the others. The main purpose of Step 4 is to establish a dear distinction between the lights (which are just bare paper), the darks, and the middletones (or halftones). Step 5. The artist begins to blend the lories of the fate with a lingenip and with a stomp. He uses his finger to blend the broad tonal areas on the forehead, cheek, jaw, and neck, Then he picks up the pointed stomp to get into tighter spots like the eyes, the side and bottom of the ntisc, the lips, and the chin. The pencil darkens the eyes and lips a bit more—then the strokes are blended with the stomp once again. The artist softens the right edge of the hair with a few touches of a fingertip. Step 6, At this stage, the artist alternates between working with the pencil and the stomp. He uses the pencil to define the eyebrows; to darken the eyes and the underside of the nose; and to strengthen the tones of the lips. Then he blends these tones with the sharp tip of the stomp. The side of the pencil scribbles broad strokes over the hair; then these strokes are blended with a fingertip. The sharp point of the pencil heightens the darks within the eyes, accentuates the nostrils, and sharpens the corners of the mouth. A few deft touches of the kneaded rubber eraser pick out reflected lights within the shadows on ihe cheek, jaw, neck, and ear— notice how the edges of these shapes become slightly lighter. The fingertip carries some tone downward to the pit of the neck, over one shoulder, and beneath the collar. Step 7- The artist presses a fingertip against the sandpaper pad to pick up accumulated graphite dust, which he carefully spreads over the shadowy ureas of the facc and hair. 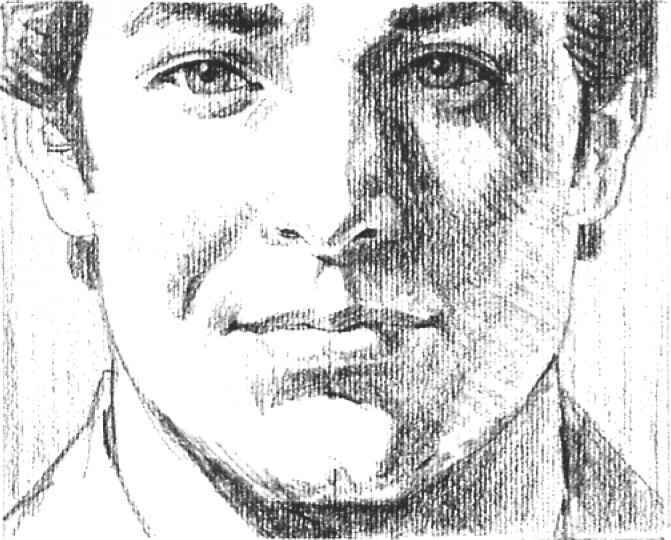 The tones of the drawing bccome richer and deeper, The sharp tip of the pencil adds the details of the eyelids, irises, and pupils; draws the nostrils more exactly; strengthens the contours of the lips; and suggests individual strands of hair. Touches of the kneaded rubber eraser brighten the lighted areas of the face and pick out streaks of light in the hair. Slender Strokes* A hard stick of chalk can be sharpened to a surprisingly line tip. So can chalk in pencil form. With a sharpened stick or pencil, you can build up the tones of a portrait with slender strokes like those you see in this close-up. The precise strokes of the drawing tool follow the curve of the hair. The artist presses harder on the chalk and places the strokes closer together in the darker areas. The tones of the cheek and eyelid are rendered with clusters of short, curving parallel strokes. 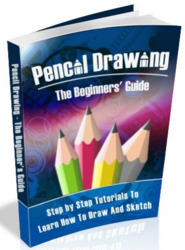 The sharp point of the drawing tool picks out the precise details of the eyes. Broad Strokes. With the blunt end of the stick of chalk, you can draw the same subject with broad strokes. 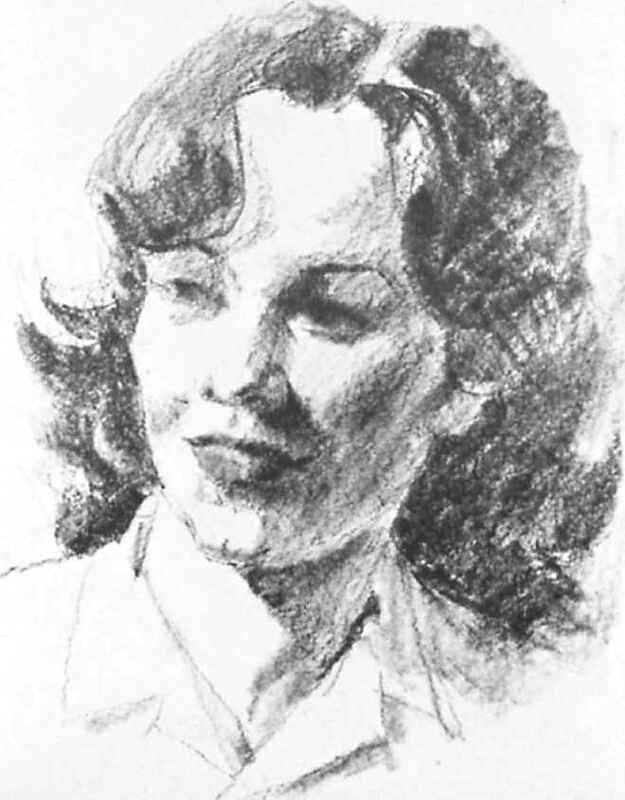 The square tip of the stick is used to make the thick, curving strokes that render the sitter's hair, as well as the clusters of short parallel strokes that model the eye socket, brow, and cheek. To render the more precise detail of the eyes, the artist simply turns the chalk so that the sharp corner of the rectangular stick touches the paper. This sharp corner can draw surprisingly precise lines, like those you see in the eyelids, irises, and pupils. Strokes on Charcoal Paper, The ribbed surface of charcoal paper is excellent for chalk drawing, whether you're working with chalk in stick or pencil form. The charcoal paper softens the stroke and lends its own subtle texture to the drawing. Tiny flecks of bare paper show through the strokes and give the portrait a special kind of luminosity which you can1! achieve on any other kind of paper. You can work with broad strokes like those you see on the cheeks. On the other hand, the paper is just smooth enough to lend itself to precise detail like the slender strokes of the features. Strokes on Rough Paper. There are much rougher papers than charcoal paper, of course, and it's worthwhile to try these surfaces. A rough sheet is best for bold, broad strokes, made with the squarish end of the chalk. Notice how free and vital the strokes look on the cheeks and jaw. On the other hand, a reasonable amount of precision is possible on rough papers: the eyes arc rendered with fairly precise, slender strokes, although these strokes are distinctly rougher than those with which the eyes arc rendered on the charcoal paper at the left. 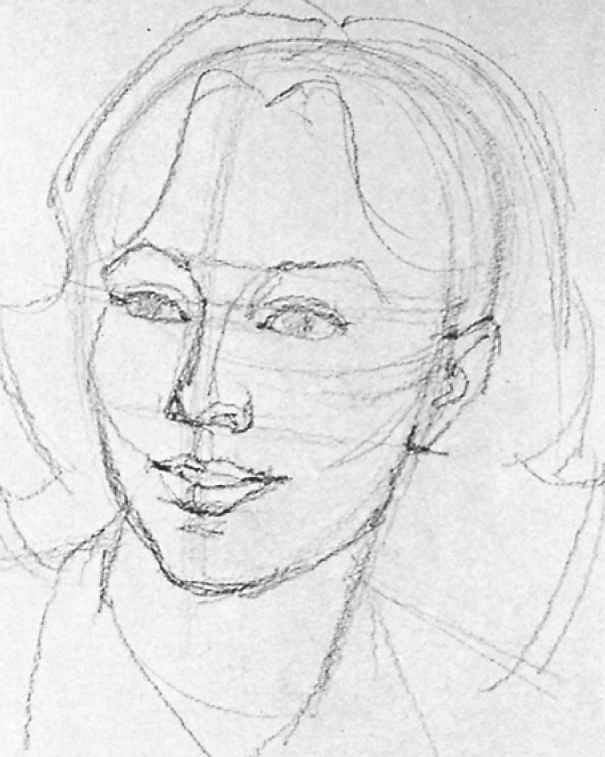 Modeling with Strokes, Working with a sharpened stick of chalk or with chalk in pencil form, you can build three-dimensional form by layering stroke over stroke* On the side of the face, the artist gradually lays one stroke over another, piling up strokes more thickly in the darker areas. 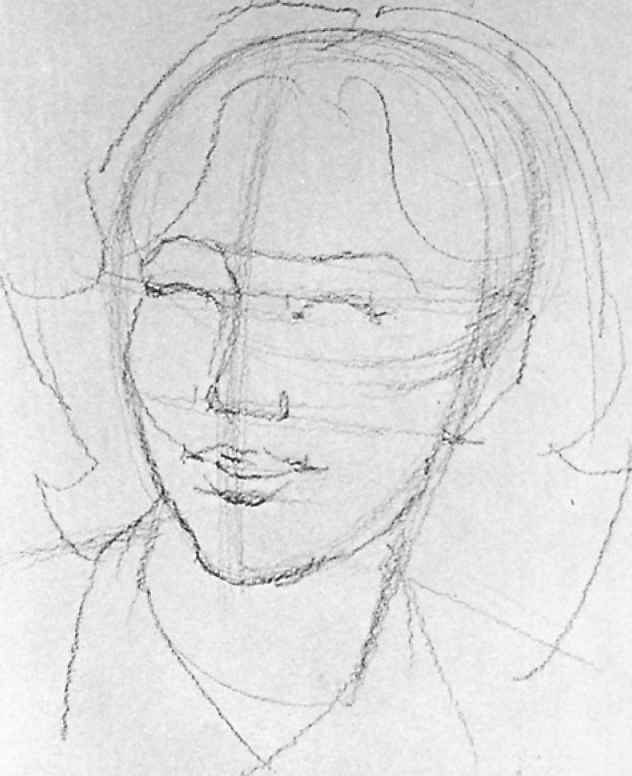 The strokes curve slightly to suggest the roundness of the face. The lips and nose arc also built up stroke over stroke. The network of strokes is dense in the dark areas, such as the shadow at the side of the nose, while the strokes are fewer and farther apart in the paler tones, such as the delicate gray beneath the lower lip. Modeling by Blending. A different way to create a strong sense of three-dimensional form is lo cover the tonal areas with free, casual strokes and then blend them with a fingertip or a paper stomp. The strokes don't have to be precise because they disappear as you blend them. The blending action converts the strokes to rich, smoky tones like those on the side of the sitter's face. If you blend some strokes, add darks with the chalk, and brighten the lighted areas with the kneaded rubber eraser, you can produce the strong contrast of light and shade that you see on the mouth and nose. Continuous Tone on Charcoal Paper. Charcoal paper—like all strongly textured paper—has distinct peaks and valleys. As the chalk moves, it tends to strike the peaks and skip over the valleys. The peaks gradually shave away granules of chalk each time you make another stroke—and the tones become darker with successive strokes. Thus, you can build up soft, luminous tones by gently moving the chalk back and forth over the paper, pressing slightly harder and building up more strokes for the darks. Work slowly, and let the tones emerge gradually, and they'll have a unique inner glow. Continuous Tone on Rough Paper, You can try the same technique on any paper that has a distinct tooth. 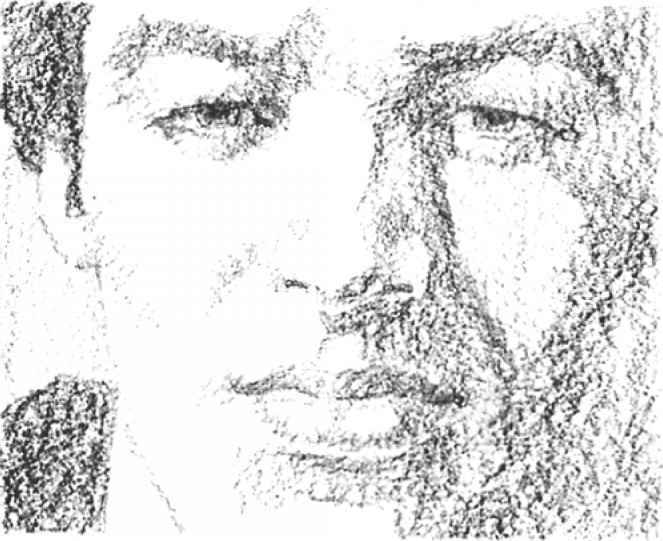 On the rough sheet of paper shown here, a drawing of the same sitter has a bold, granular quality. Once again, the artist moves the chalk back and forth gradually so that it hits the peaks and skips over the valleys. With each successive movement of the chalk, more granules of chalk pile up and the darks become richer. It's almost impossible to see an individual stroke. The granular texture of the sheet dominates the drawing. Step 1. When you draw your first portrait in chalk, see what you can do with just lines and strokes—no blending. A hard, fairly slender stick of chalk, such as a Conte crayon, is best for this project. The artist begins by sharpening the stick on a sandpaper pad so that the tool will make slender, distinct lines. He draws the classic egg shape. The portrait is a direct, frontal view, and so the vertical center line divides the face into equal halves. He draws the usual horizontal lines to locate the features—with a double line for the dividing line of the mouth and the underside of the lower lip. Just two vertical lines suggest the cylindrical form of the neck. The artist begins work on the features by placing the ears on either side of the egg, with the tops of the cars aligning with the eyebrows, and the lobes aligning with the underside of the nose. because it accentuates the roundness of the lower lip. 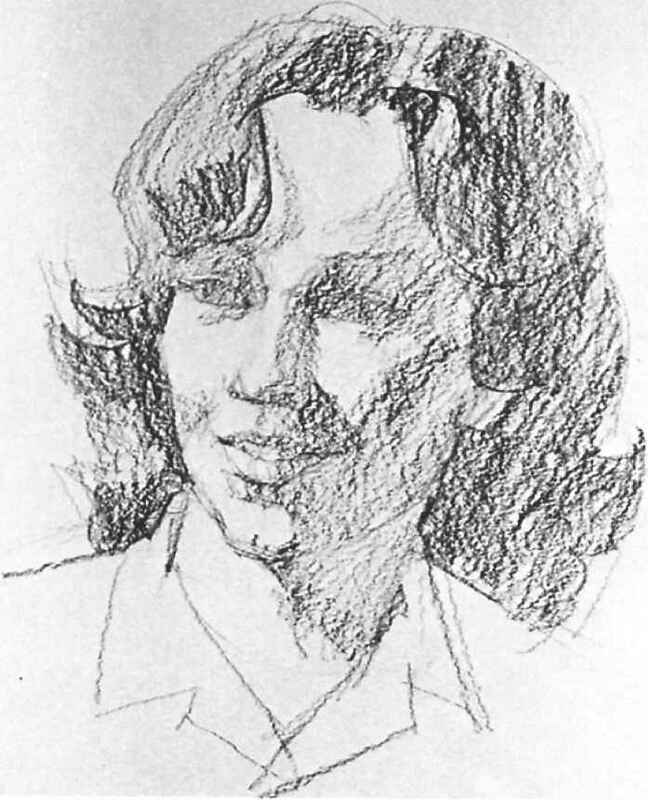 How to sketch portrait by charcoal? 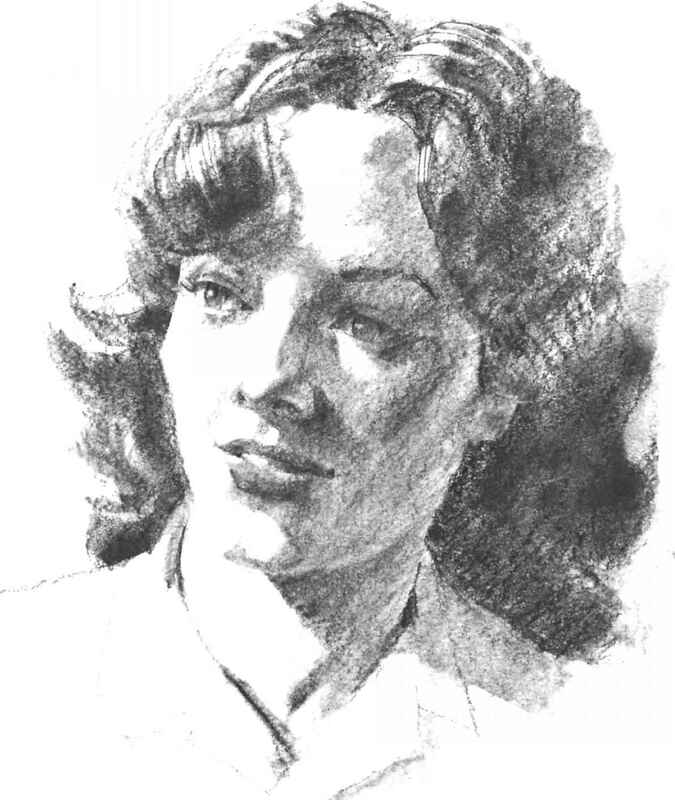 How to draw a tonal drawing portrait? How to draw anime hair strans strokes? How to draw portraits in charcoal? How to sharpen charcoal stick? How to draw portait with powder charcol? How to draw realistic chin forehead step by step? What are strokes in a drawing? What is a paper stomp portraits? How to shade a face and chin? How to use charcoal pencil in a portrait with step by step photo? 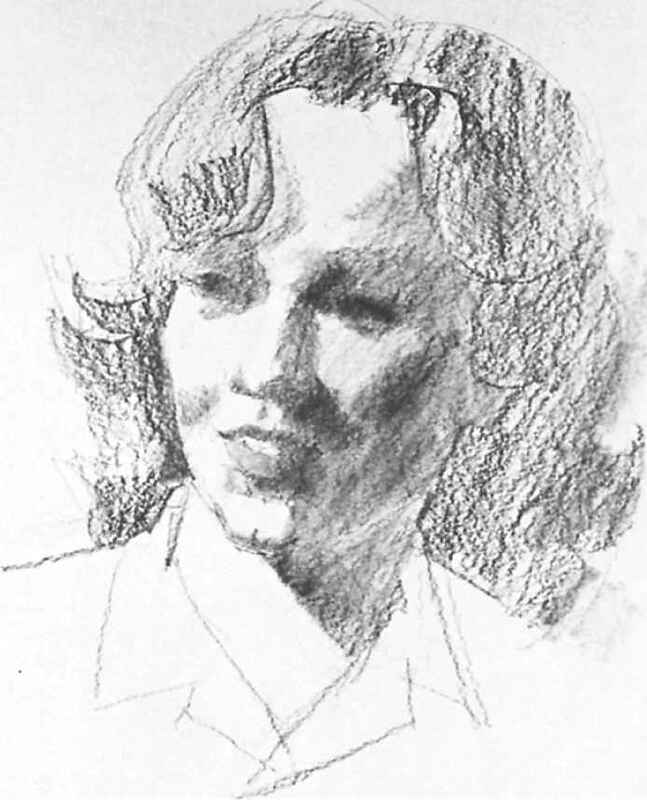 How to shade portrait with charcoal step by step? How to draw a face with a thick charcoal stick? 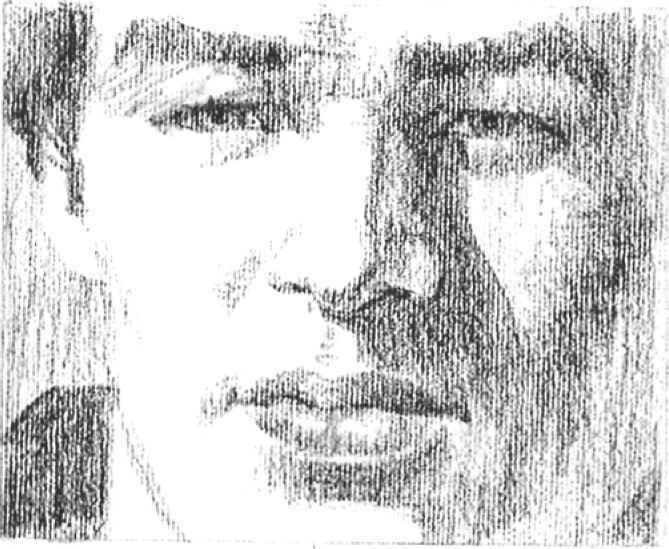 How to draw chin in portrait drawing? How to draw a nose using charcoal pencil step by step? How to blend a portrait with charcoal? How to draw realistic cheekbones?